BRINE PORK CHOPS: In large measuring cup combine water and salt, and let mixture sit 5 minutes, or until the salt dissolves. 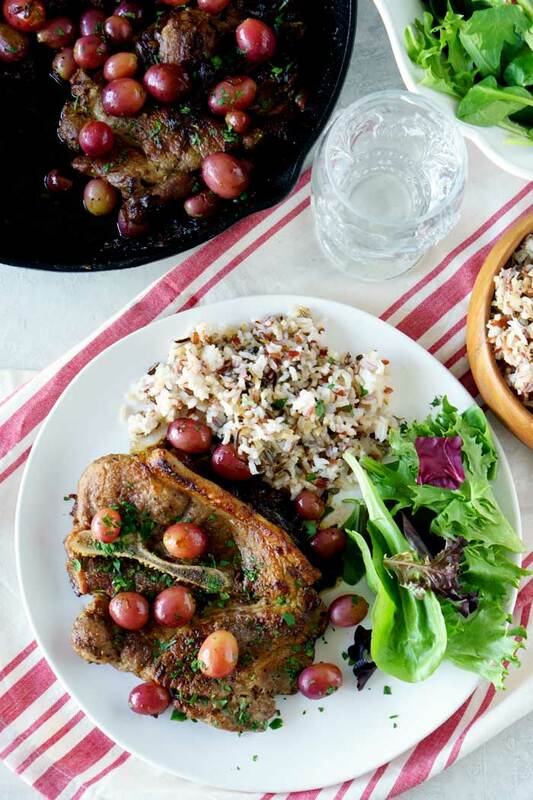 Place pork chops in 9x13-inch dish and pour brine over chops. Cover and chill for 30 minutes (up to 3 hours). CARAMELIZE SHALLOTS: While the chops brine, heat butter in cast-iron skillet or another heavy-bottomed skillet over medium-low heat. Once butter has melted, add shallots and cook, stirring occasionally, until deeply golden and caramelized, about 20-25 minutes. Remove shallots from skillet, and set aside. COOK PORK CHOPS: Move oven rack to middle position and preheat to 400 degrees F. Turn the heat up to medium-high and preheat skillet. Take pork chops out of brine, and pat dry and rub both sides with olive oil and season with salt and pepper. Place pork chops in preheated pan (depending on pan size, you may need to work in batches) and cook until chops are golden, about 2-4 minutes. Turn chops over, and cook until golden again, about another 2-4 minutes. Remove chops from pan, and turn heat down to medium-low. Add Holland House Red Cooking Wine, chicken broth, and caramelized shallots and simmer until slightly thickened, about 5 minutes. Nestle pork chops into liquid, and bake skillet for 15 minutes. Add grapes to skillet and bake another 5 minutes. Sprinkle parsley over pork chops and serve.